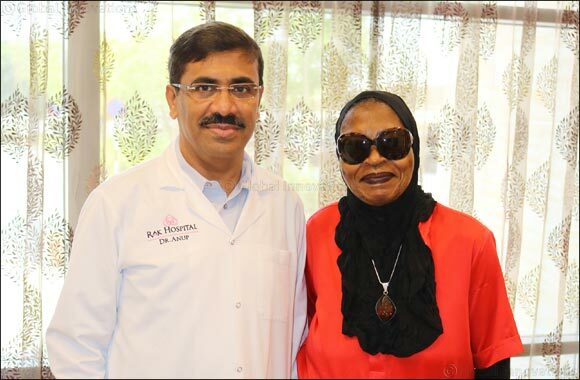 29th August 2018; Ras Al Khaimah, UAE: After going through two unsuccessful surgeries abroad and suffering for nearly 2 years with excruciating pain in stomach, throat and difficulty swallowing, Bindu F Dukuly, a 73 year old American woman finally found cure at RAK Hospital. The patient had Achalasia cardia, a serious condition caused by the absence of nerves in esophagus. The commonest symptom of achalasia is difficulty in swallowing. Patients get a sensation that swallowed food as well as liquids gets stuck in the chest. This problem invariably progresses and becomes severe. Other symptoms include regurgitation of swallowed food and liquid, chest pain, heartburn, a sensation of fullness or a lump in the throat, hiccups, and weight loss. Doctor's team at the minimal access department of the hospital was quick to diagnose the dysfunction of food pipe and the esophageal function was restored by the expert team of surgeons using sophisticated advanced technology for keyhole surgery, avoiding any big surgical incisions and scars. “The previous surgeries done outside UAE didn't provide any relief to the patient as the disease wasn't even diagnosed properly.As a result, the case had complicated further and it was quite a challenge to operate on her. Besides, she had lost a significant amount of weight and was very weak, which made it even more difficult to perform corrective surgery. She had reached a stage wherein swallowing liquids was also impossible for her, making the condition totally unbearable. Furthermore, the agonizing pain from her stomach and throat radiated to her ears and even arms, to an extent that even bending and lifting became tedious tasks”, commented Dr. Anup Kumar Panigrahi, Sr. Specialist and Head of Department, Minimal Access Surgery. It is estimated that in this disorder, 80-90% of the patients may feel regurgitation, while 20-50% patients may experience chest pains after eating. Heartburn is also a common symptom amongst most patients.Due to the similarity of symptoms, this rare disorder can sometimes be mistaken for gastroesophageal reflux disease (GERD), hiatus hernia, and even psychosomatic disorders and heart attack. “The chest pain experienced during this condition can often be mistaken for a heart attack. It can be extremely painful in some sufferers. Food and liquid, including saliva, are retained in the esophagus and may be inhaled into the lungs. Patient was relived through Laparoscopic Heller-Dor operation, which is an effective and safe surgical procedure in resolving symptoms of achalasia and today presents the method of the first choice in the treatment of this disease”, added Dr. Panigrahi. Dr. Raza Siddiqui, Executive Director of RAK Hospital said, “Our team of expert doctors has treated many challenging cases and this is just another feather in our cap. We are glad that the procedure was successful and patient suffered no complications post-surgery”. Commenting on the ordeal, patient, Bindu F Dukuly said, “I cannot thank the doctors at RAK Hospital enough for alleviating my pain and giving me my life back. After going through two unsuccessful surgeries and years of pain, I finally found relief and able to enjoy my life. Throughout my stay at the hospital, I was treated like a queen; the facility is immaculate, team of doctors and nurses very compassionate and caring. God bless them all”. The patient recovered well from the treatment and was discharged two days post operation. She is currently enjoying her good state of health and relishing her favorite foods.